As the season of me going completely candle crazy is upon us and I simply cant resist buying candles I thought I would share the latest few that I picked up in my local garden centre, I decided to repurchase a couple of the Halloween candles and of course buy a few festive ones too, well it would of been rude not too wouldn't it! Firstly I knew I wanted to stock up on Yankee Candles Halloween scent Candy Corn, this is my all time favourite Halloween scent because it's so sweet and yummy. It has a 'candy/sugary' vibe running through it, and I also get waves of vanilla, caramel and butterscotch when I burn this, oh my it's divine! Even though Candy Corn is a sugary, sweet scent it isn't sickly or heavy at all, instead its very light and and the scent throw is subtle but still recognisable. I love this one soooooo much and my boyfriend even treated me to the medium size jar as well as another votive, what good egg he is! Moving on to the three festive scents I picked up, and I have to add I was very and I mean very restrained when buying these, I actually shocked myself that I only picked three up he he. The first one I got my paws on was the ever so popular Christmas Cookie, as you can probably already tell I like my sweet, foodie scents and this one ticks all the boxes for me, it's sugary sweet, has vanilla running through it and it has a bakery vibe too as if you where actually baking sugar cookies, it's absolutely delicious! I then picked up Berry Trifle, I believe this was new to Yankee Candle in 2015 so I'm so happy they have brought it back this year because I loved it last year, it's quite a fruity yet sweet scent and raspberries and cranberries definitely comes through, theres a light vanilla fragrance too which comes from the vanilla cream but the berry scent is definitely what comes out on top and is the most recognisable, it's gorgeous. Lastly but in no means least I got Christmas Memories, again I had this one last year and was so happy to see it on the shelves again, it's literally like every festive smell within one candle, it's sweet, spicy, warming and so christmasy, I'll definitely be buying more of this one over the Christmas period! 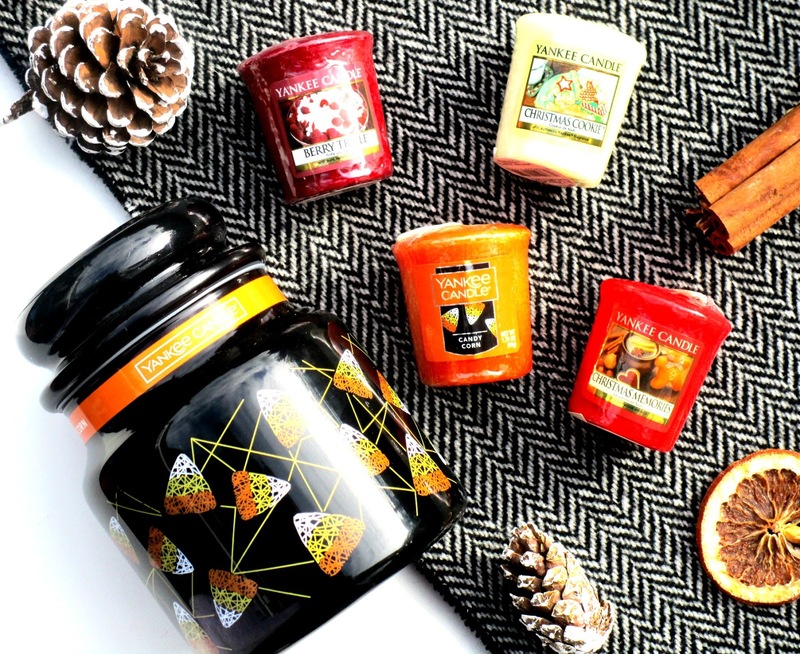 Have you picked up any seasonal Yankee Candles yet beaut's? Which did you go for? I 'd love to know! I love Christmas cookie and Christmas memories they are two of my all time fave yankee scents! I go wild for candles at this time of the year too! Candy Corn sounds like actual heaven in a candle! I'm definitely in need of a smell of that! Christmas Cookie is also a firm favourite of mine! :) My favourite Yankee for Autumn has to be Mandarin Cranberry, it's so perfect!